The U.S. Geological Survey, in cooperation with the New Mexico Environment Department, is investigating the pre-mining ground-water chemistry at the Molycorp molybdenum mine in the Red River Valley, northern New Mexico. The primary approach is to determine the processes controlling ground-water chemistry at an unmined, off-site, proximal analog. The Straight Creek drainage basin, chosen for this purpose, consists of the same quartz-sericite-pyrite altered andesitic and rhyolitic volcanic rock of Tertiary age as the mine site. The weathered and rugged volcanic bedrock surface is overlain by heterogeneous debris-flow deposits that interfinger with alluvial deposits near the confluence of Straight Creek and the Red River. Pyritized rock in the upper part of the drainage basin is the source of acid rock drainage (pH 2.8-3.3) that infiltrates debris-flow deposits containing acidic ground water (pH 3.0-4.0) and bedrock containing water of circumneutral pH values (5.6-7.7). Eleven observation wells were installed in the Straight Creek drainage basin. 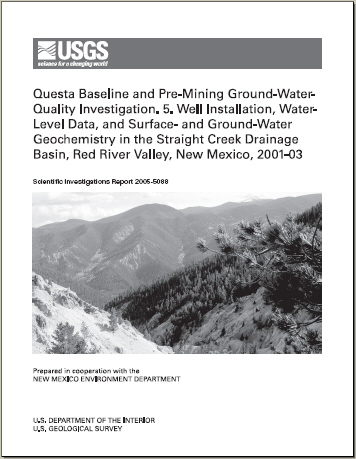 The wells were completed in debris-flow deposits, bedrock, and interfingering debris-flow and Red River alluvial deposits. Chemical analyses of ground water from these wells, combined with chemical analyses of surface water, water-level data, and lithologic and geophysical logs, provided information used to develop an understanding of the processes contributing to the chemistry of ground water in the Straight Creek drainage basin. Surface- and ground-water samples were routinely collected for determination of total major cations and selected trace metals; dissolved major cations, selected trace metals, and rare-earth elements; anions and alkalinity; and dissolved-iron species. Rare-earth elements were determined on selected samples only. Samples were collected for determination of dissolved organic carbon, mercury, sulfur isotopic composition (34S and 18O of sulfate), and water isotopic composition (2H and 18O) during selected samplings. One set of ground-water samples was collected for helium-3/tritium and chlorofluorocarbon (CFC) age dating. Several lines of evidence indicate that surface water is the primary input to the Straight Creek ground-water system. Straight Creek streamflow and water levels in wells closest to the apex of the Straight Creek debris fan and closest to Straight Creek itself appear to respond to the same seasonal inputs. Oxygen and hydrogen isotopic compositions in Straight Creek surface water and ground water are similar, and concentrations of most dissolved constituents in most Straight Creek surface-water and shallow (debris-flow and alluvial) aquifer ground-water samples correlate strongly with sulfate (concentrations decrease linearly with sulfate in a downgradient direction). After infiltration of surface water, dilution along the flow path is the dominant mechanism controlling ground-water chemistry. However, concentrations of some constituents can be higher in ground water than can be accounted for by concentrations in Straight Creek surface water, and additional sources of these constituents must therefore be inferred. Constituents for which concentrations in ground water can be high relative to surface water include calcium, magnesium, strontium, silica, sodium, and potassium in ground water from debris-flow and alluvial aquifers and manganese, calcium, magnesium, strontium, sodium, and potassium in ground water from the bedrock aquifer. All ground water is a calcium sulfate type, often at or near gypsum saturation because of abundant gypsum in the aquifer material developed from co-existing calcite and pyrite mineralization. Calcite dissolution, the major buffering mechanism for bedrock aquifer ground water, also contributes to relatively higher calcium concentrations in some ground water. The main source of the second most abundant cation, magnesium, is probably dissolution of magnesium-rich carbonates or silicates. Strontium may also be derived from carbonate dissolution. Feldspars are likely sources of silica, sodium, and potassium. Other possible sources of silica are sericite, biotite, phlogopite, chlorite, epidote, and kaolinite. Manganese in bedrock aquifer ground water may be derived from rhodochrosite or manganese oxides. Although not striking from comparison of lithium or beryllium to sulfate concentrations in surface and ground water, strong correlations between beryllium and lithium in surface water and shallow ground water indicate that a beryllium-lithium association in the mineralization also is imparted to ground water. Aluminum, fluoride, silica, lithium, copper, and beryllium in samples from wells near the mouth of the debris fan often do not follow the common dilution trend of decreasing concentrations with sulfate in a downgradient direction. The departure is greatest for aluminum and silica. Aluminum is leached from minerals in the debris flow under acidic conditions, but its concentration is a function of pH and decreases substantially above a pH of 5. The data indicate that precipitation of both aluminum and silica can occur at a pH of around 4. An alternate explanation for the departure of these constituents from the dilution trend is the lack of a direct flow path from upgradient debris-flow aquifer wells to the wells closer to the Red River. However, linear best-fit lines on plots of some constituents do include the discrepant wells. Mixing among debris-flow, bedrock, and alluvial aquifer ground water in the Straight Creek drainage basin is evident from the chemical data. High pH in some samples of debris-flow aquifer ground water is an indication of the influence of more neutral bedrock or Red River alluvial aquifer water. Similarly, mixing of bedrock and debris-flow aquifer ground water is indicated by low pH in samples from some bedrock aquifer wells. Mixing of water from these two aquifers also is indicated on various plots of concentrations of almost all constituents. In the lower part of the Straight Creek debris fan, mixing of ground water in alluvial, debris-flow, and bedrock aquifers is indicated by results of helium-3/tritium and CFC age-dating analyses; evidence of dilution of bedrock and debris-flow aquifer ground water by alluvial aquifer water; and high pH and low specific conductance in debris-flow aquifer ground water in wells close to the Red River. Ground water in this area also appears to be mixing with submodern (predating 1940's) ground water, the source of which may be discharge from deeper bedrock associated with mountain-block recharge. Helium-3/tritium dating yielded ages of shallow ground water ranging from less than 0.5 to about 23 years and of bedrock aquifer water from about 15 to greater than 60 years; ground water from wells completed in alluvium and debris-flow deposits is almost always younger than that from bedrock aquifer wells. CFC dates for alluvial and debris-flow aquifer wells ranged from approximately 10 to 45 years and for bedrock aquifer wells ranged from approximately 20 to 47 years. CFC dating yielded considerably different ages for CFC-11, CFC-12, and CFC-113, almost all of which are older than helium-3/tritium ages, probably because of microbial degradation of CFC's in anaerobic conditions.